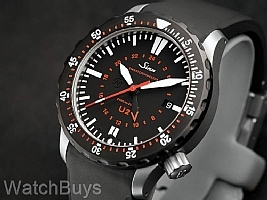 This is the Sinn U2 SDR with black bezel, the 2,000 meter divers watch with attitude. 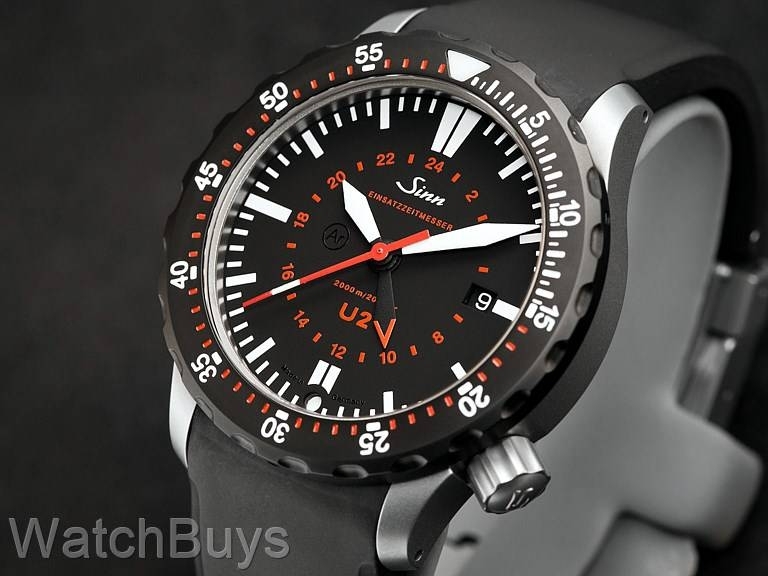 Sinn took all that's great about the best selling Sinn U2 and added a fully Tegimented black bezel with a hardness of 1,500 Vickers, more than 7 times the hardness of standard stainless steel. The black bezel creates a perfect contrast with the submarine steel case, and with the white and red markings is highly legible. The technology and design elements used to create the Sinn U2 SDR go far beyond standards used at most watch companies. The Sinn U2 SDR case is made from the same German steel that is also used in the construction of the outer hull of submarines. The steel was procured by Sinn from a steel supplier to Emden GmbH, one of Germany's North Sea shipbuilding yards who construct submarines from the very same steel. The Sinn U2 SDR has full UTC functionality through the use of an additional short red tipped hour hand which can be set independently from the primary time zone and indicates the second time zone using a 24 hour display. Screw down crown. The Sinn U2 SDR features an inert gas filled cavity with two copper sulphate humidity absorbing capsules, which are visible at 6. Matte black dial with date at 3, Super Luminova on hands and markers, and striking red seconds hand complete the design. Other features include sapphire crystal with hardened anti-reflective coating, and silicone rubber strap with double push deployant buckle and fliplock safety clasp. Verified Owner Comments: Bought a U2 dive watch and am very happy with it. Watch seems indestructible and the strap hugs my wrist nicely. Service at Watch buys was outstanding too. All of my questions were answered in great detail. Highly recommend watch and Watchbuys. Verified Owner Comments: I've had this watch for a little over a month now. It's everything I thought it would be, and the accuracy has been outstanding. It started about +2.5 s/d, and has now settled down to about +1.5 s/d.